Have you ever noticed how many product descriptions are hard to understand? Don't you find that especially ironic when it pertains to communications products? 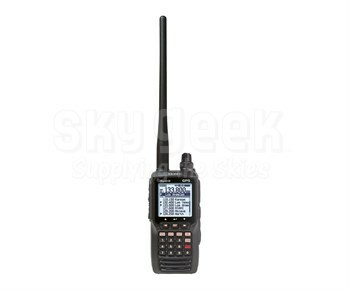 The Yaesu FTA-750L is a handheld VHF Transceiver/GPS. If you want to read a jigsaw puzzle of a description complete with jargon, examine the official FTA-750L Product Page. � An integrated 66 Channel WAAS GPS receiver allows you to quickly store current position information as well as manually enter waypoints for reliable navigation. When a waypoint is activated the navigation screen conveniently displays a compass with bearing, course over ground, distance and speed information. � GPS logging is possible and when activated automatically stores your position information at preset intervals. Backtrack if you prefer. � Receiving a VOR signal, its display will automatically switch to the Navigation band screen, with CDI (Course Deviation Indicator) based on the received VOR signal. � The menu is easy to operate; configure with the help of an icon driven system. Can anyone say, ?Intuitive interface?" � Monitor data input thanks to a huge .7" x 1.7" full dot matrix LCD display (160 x 160 dots) ith full backlight and dimmer. � This transceiver can store up to 200 memory channels. Name them using up to 15 alphanumeric characters per name for quicker retrieval. � Channel configurations are PC re-programmable; simply use the supplied USB programming cable and the optional YCE01 programming software.